The Boston Whaler and the outboard motor have been an almost perfect match since the inception of the boat. This is mainly due to the wide stern and seaworthy hull design. You get a safe feeling in a Whaler that you don’t get with other designs. When your kids go out in a Whaler you don’t worry quite as much. There are, however, some issues that if corrected would make the boat even safer and more enjoyable. Especially in heavy seas. 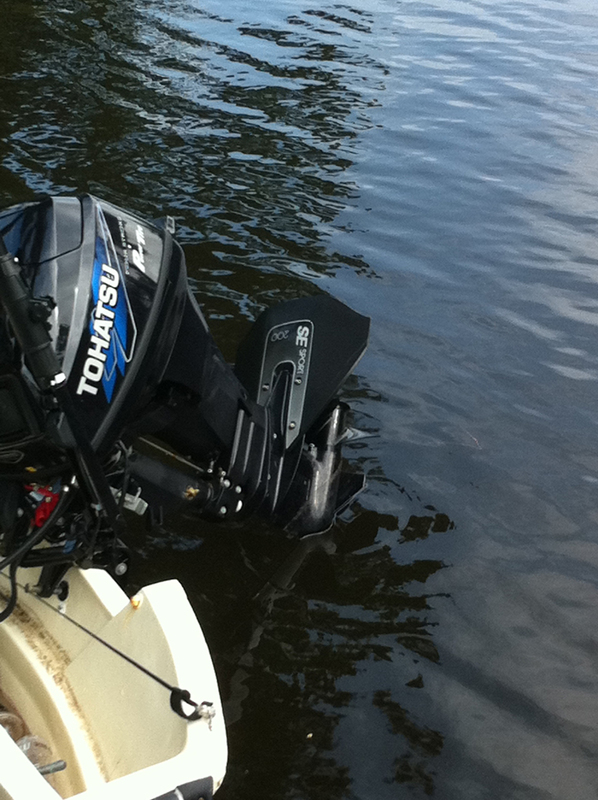 These issues center around the outboard motor. An outboard sits at the very back of a boat which is where the operator, fuel supply and battery are as well. This creates a boat that is back heavy. On longer boats this is not as much of an issue but on 13 and 15 footers it is. One of the issues with a short boat that is back heavy is the tendency of the bow to rise excessively during planing. In heavy seas this can create an uncomfortable situation for the operator. When running into the wind it feels like you will flip over backwards. Also, when slowing down the boat tends to want to come off of a plane quicker and the bow goes back up. In heavy seas you often want to slow the boat down but not to the point where you come off of a plane. Another issue for boats that are underpowered is the time it takes to get onto a plane. In some situations the motor is not able to do this at all. For example, a 13 foot Boston Whaler with a 9.9 horse engine will barely get onto a plane if at all. Short boats in heavy seas tend to get tossed around quite a bit. On longer boats in excess of 17 feet this is not as noticeable. Although this cannot be eliminated, it can be reduced. The foils provided lift and keep the bow of my boat down during planing. The boat remains on a plane at much lower speeds which is great in rough seas. This is probably the best feature. When it gets rough I have a wide range of speeds that I can choose from. Before, I only had full speed and idle because when I slowed a little the bow would rise and the boat would get tossed around. The fins seem to stabilize the boat as well. This is also true when we tow it provided the motor is left down. The effect is similar to a gyroscope. The SE Hydro Foil seems to reduce cavitation. There are several fins available and they all work in generally the same way. Some provide more lift than others. Some are two piece and some are one piece. It is my opinion that the foils or stabilizers work best on smaller boats. The reason is that larger boats simply do not have the same issues to correct. Also, you will see where people claim it makes the boat go faster. I have not seen a noticeable difference. If anything it may knock a half a mile per hour off your speed. It really depends on whether the stabilizer remains underwater at full speed. Here is a list of stabilizers.